It’s a Saturday night in May and it’s cold, cold enough to wear an extra layer of clothing or, as many fans are doing, wrap yourself in a Cubs blanket (only $50.00 at the gift shop; stop on by!). The lights shine brightly, the depressing stats on the scoreboards hurt your eyes, they’ve stopped serving beer, and the thinning crowd chants hungrily for some entertainment in an otherwise difficult game for the Cubbies. I’m sitting with my son at the game, which started 5-0 in favor of the Yankees after just one inning. 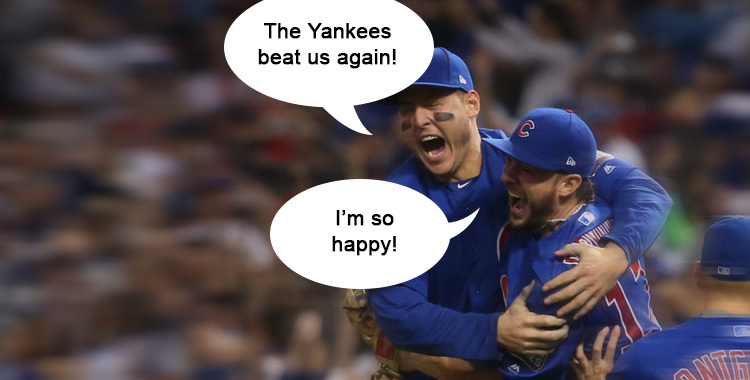 It’s the world champion Cubs, they’re just spotting the Yankees those runs to keep it fair, right? My son is only twelve so he’s pretty bummed about the score. Someone sitting next to me is visiting Wrigley for the first time and they’re pretty bummed about it, too. But they’re old enough for beer, so it’s okay. And they have a blanket. As the night goes on, though, the Cubs show life. They score a few runs and even deliver a couple of good defensive plays, but they can’t get close to the Yankees. At the top of the eighth inning we decide to head out so we can stop at the gift shop at the north end of the new “Park at Wrigley.” I buy my son a replica 1908 hat, a collection of Topps Cubs team cards, and then we step back outside. The Park at Wrigley during games, or at least during this game, is inaccessible without game tickets. Combine that with the cold and late hour and that left few people hanging about. The park consists of a small, grassy area surrounded by a brick walkway, but it’s nicer than it sounds. There’s even a makeshift bar on one side, along with a handful of tables and chairs. On the gift shop exterior hangs a huge video screen. Earlier in the day, before the game began, we watched the running of the Kentucky Derby with a packed park of Cubs fans. Now the screen shows the Cubs game. It’s not every day we get to go down to Wrigley Field and watch the Cubs play the Yankees, and my son isn’t ready to give it up. He asks if we can sit in the park and watch the rest of the game. Personally, I don’t want to watch Starlin Castro belt another three-run homer across the Wisconsin state line, but when I look up it’s the top of the ninth inning and I see Cubs manager Joe Madden bringing in his ace relief pitcher. That’s right, warming up the mound is backup catcher Miguel Montero. Naturally, my son goes bananas. He’s seen Travis Wood play left field to start an inning and then pitch in the same inning. He was at the game where Jon Lester got his first hit. He’s seen a Cubs World Series victory. But he’s never seen this. We sit down a table with our gift shop prizes while next to us a man and his five-year-old daughter play in the grass, having the kind of adorable father-daughter moment you can only find in real life and not in the movies. Up on the screen we watch as Montero throws a couple of pitches wide. When he gets a strike right down the middle, the crowd goes nuts. My son laughs out loud because he absolutely loves it. Then Montero gets an out. You might as well stop the world right at that moment. There is nothing left to see in life. Montero eventually gives up a hit but somehow manages to pitch an efficient, scoreless inning. His pitches even have some nice movement to them. He may have been the best Cubs pitcher on a night that saw far too many of them. I try to get my son to leave after that, so we can beat what’s left of the crowd. He isn’t having any of it. So, we stay and watch the Cubs do nothing in the bottom of the ninth and lose without making much noise. It was just one of those nights. I’m not one to champion the line of thinking that the kids somehow always know better than the adults. You see that on a lot of television commercials. But this time he’s right. I guess I’ve matured enough as a father to recognize the moment. I least hope so. So, we sit together in the cold air of the Park at Wrigley and watch Miguel Montero mow down the opposition.